Jon Jones’ victory at UFC 128 was a hard-to-believe tale, that one day, it will be part of a movie that the audience will assume as fiction. Still, it began when the 23-year-old UFC fighter foiled a robbery, and ended late in the same night when earth encountered the Perigee once again after 18 years. 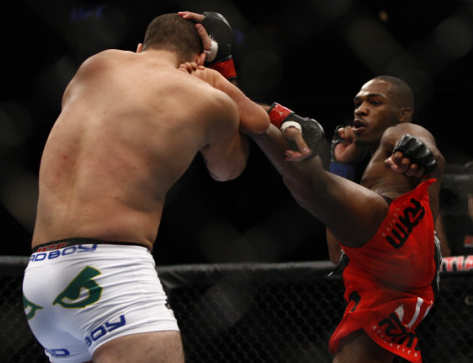 Jon Jones controlled the action since the opening touch of gloves, until referee Herb Dean pulled him off a grounded Shogun Rua. He won via TKO, and at 23, he is the youngest champion in the UFC history. The road to fame was filled with green lights and short cuts, but Jon Jones just sped through it with ease when he encountered a bump. His roller coaster ascension to the top of MMA’s well-known promotion was stunningly fast. Jon Jones started his training over three years ago, the time when Mauricio Shogun Rua was already considered as one of the best light heavyweight fighters there is in MMA. He was initially labeled as more than 2-to-1 betting favorite, but Jon Jones continuously believed that he will be signing autographs with “Champion 2011″ following his name.